Only 3-7/8 inches long when folded, the three-ounce Case Canoe's upswept nickel steel bolsters gave this model its name. Set on its spine, the knife does slightly resemble the shape of an old birch-bark canoe. The ample handle gives users plenty of leverage, and the India stag horn handle slabs provide a natural grip with no need for jigging. The amber color of the horn darkens gradually with age. The slip joint knife includes a main blade with a strong spear-point shape and a handy smaller blade in the penknife pattern. Both are very useful blades and handle ordinary tasks like carving and reaming extremely well, although the original purpose of the penknife blade was to sharpen the points of turkey quill pens. What's new and better in the Case Damascus Canoe knife is the steel. Folded layers of high carbon steel form the stock for these blades, but advanced processes allow the creation of deliberate patterns in the steel layering. Forging marks dimple the steel stock and form raindrop patterns enhanced by etching and polishing. This type of high carbon Damascus steel is darker than shiny modern stainless steel, and you'll need to clean and oil the knife occasionally to prevent corrosion. I wouldn't be concerned -- my high carbon steel knives from before the stainless steel fad began are still doing fine. 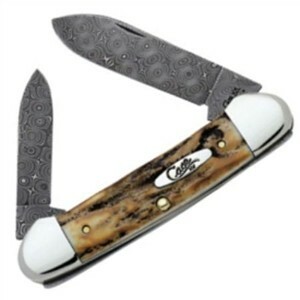 For a more economical working knife from Case, see the Case Trapper Pocket Knife.